But when it comes to accessories, especially jewelry, these guidelines don't apply as strictly, and most of the time, they don't apply at all. There never is right or wrong and, more than in any other fashion field, many different styles will always share center stage peacefully. Materials used range from fancy gold and platinum, to silver, bronze, and anything that will ply and be shaped in the most original ways. Then the fun begins, once they mix in some wood, or resin, or beads, or glass, or even rocks! The jewelry business must be a fun business, because the people behind it can really let their imagination run free, without any limits. With jewelry anything is possible. And people will wear extravagant designs, big necklaces, small necklaces, wooden beads necklaces, iron-wrought necklaces, pearl necklaces, diamond necklaces... and then you have the earrings, the bracelets, the rings... the possibilities are really endless. So how do you pick the right jewelry for you? Nothing can be easier, since there is so much to pick from, and, sometimes, at very affordable prices. But nothing can be harder, other times, because the incredible variety can be overwhelming, or you just can't take your eyes off the most expensive piece of jewelry in the store. So I figured I would help you out, by giving away three different pieces of jewelry to 3 of NY Spender's readers! 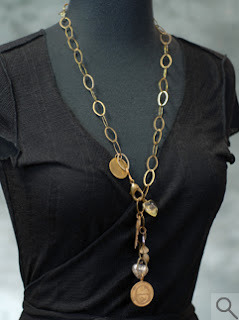 The first prize is a beautiful brass necklace with lots of cute charms by Twisted Silver. The philosophy behind Twisted Silver is that of the "convertible jewelry", so you can wear this necklace as a necklace (of course) but also as a charm bracelet. 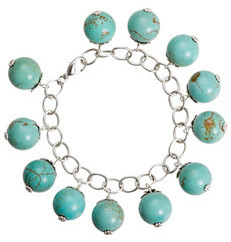 The second prize is a gorgeous silver and turquoise bracelet from Luxe Jewels. Here is a different kind of jewelry company, with entrepreneurial opportunities for women. You can buy their jewelry, but you can also sell them too! From Luxe Jewels, is also today's third prize. Stunning Black CZs surrounded by 14kt gold-filled hoops. For a chance to win one of these pieces, just send me an email with your name, your email address, and the piece you like best out of the three. I will post the winners next Sunday. Good luck! Gorgeous jewelry. I emailed you. Jewlery is definately my favorite part of any outfit. I love buying jewelry from indie designers because you can get such unique, great quality, and beautiful pieces that really show off your own individuality. Goodluck everyone!! lovely jewelry! i like the earrings best! I am so happy to have won the necklace!! everyone always asks where I bought it and who it's from!! The charms are gorgeous, I feel like a rock star when I wear it.